Massimo Cellino has completed his takeover of Championship side Leeds United, according to his lawyers. He agreed a deal to buy a 75% stake in the club through his company Eleonora Sports in February but his takeover was vetoed by the Football League in March. The 57-year-old Italian won his appeal against that ruling on Saturday. 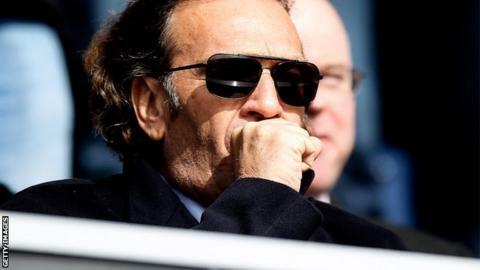 His lawyers Mishcon De Reya tweeted: "Massimo has been appointed a director of LUFC Holdings & ESL has completed its purchase of 75% of the shares." The Football League are yet to confirm that the deal has officially been completed. The news comes on the same day that the club announced losses of £9.5m for the financial year 2012-13. Cellino said in a press conference on Tuesday that he would not be putting the club into administration. "We have losses and we have to pay them. I thought the losses were less but it is OK," he said. "We have to stop wasting money that is not ours. "I would never let the club go into administration; I did not come here to do that. I've never run a company in my life that went into administration. "The club has a little illness at the moment but it is not in the hospital." The Cagliari owner, who is looking to sell the Italian club, said he will give manager Brian McDermott some time before deciding on the 53-year-old's future. Leeds have lost six of their last seven matches and face Watford at Vicarage Road on Tuesday. "I want to give Brian an opportunity to find out if he is good or not and if he is good then I am glad and if he is not then I will have to change. But I hope not," he said. "I will give him until the end of the season for me to get to know Brian and the players better. There is no rush. "We have to be loyal and help each other."